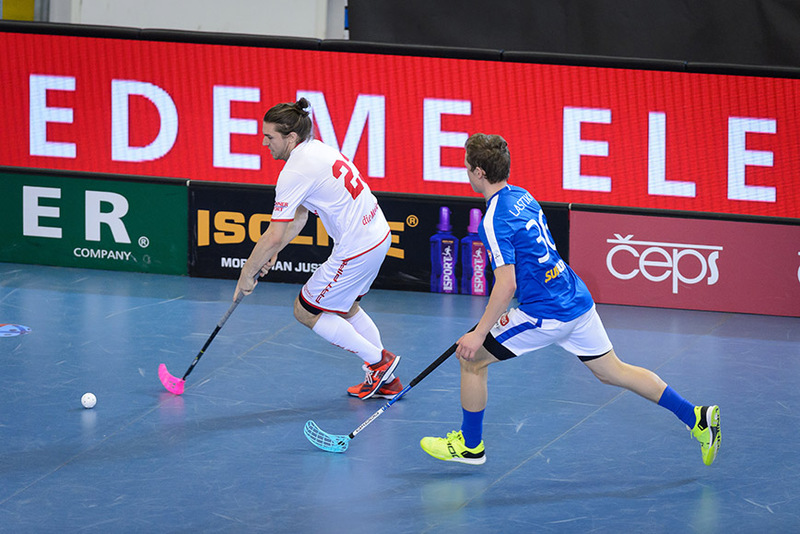 Euro Floorball Tour in the Czech republic continued on Saturday where in men category Switzerland played Finland. Swiss players beat their opponents 6-4. We attempted to explain what kind of data we track and why in yesterday´s article. We will use similar approach and variables (types of possession, clear paths, odd man rushes or cross field passes) to analyze the game in which Switzerland went on early 4-1 lead in the first period. Dynamics of the game played important role in the game. Switzerland had a great first period as they dominated in all relevant aspects of the game. They generated 4 more odd man rushes than Finland (10-6), 4 more turnover situations (7-3). Furthermore they yielded 3 more clear paths (12-9) in the first period and executed much bigger share of them (8-2). Deservedly so they jumped to comfortable 4-1 lead. Creativity of Finland´s offense increased greatly in the second period. They created much more cross field pass opportunities (4-11) as well as odd man rushes (2-6). Unfortunately for them they converted only one situation into a goal scored and thus goal differential remained the same (5-2) after the second period. Swiss team came over to control the game in the third again. Every offensive attempts for Finland was countered by Swiss attack and so the game ended with the win for team Switzerland. Overall spectators witnessed much more open game that the one day before. There were also more dangerous offensive opportunities yielded such as clear paths or odd man rushes. Concerning quality of possessions Switzerland was the better team overall. Switzerland had 7 more clear path opportunities (31-24) in the game. What is more, they were able to execute them with significantly bigger share (18-11). Also in odd man rush opportunities Switzerland was a team with more chances (20-16). First finnish line (Vaananen, Stenfors, Kailiala, Kukkola, Kotalainen) was again active in yielding cross field pass opportunities. Behind them on the Swiss side it were Heller, Bischofberger, Mendelin, Engel and Maurer with more cross field pass opportunities than opponent. More importantly same players for their respective teams were able to generate more clear paths than opponent in the game. Third Swiss line of Berry, Graf, Laely, Braillard and Ruegger finished with positive differential in this category as well. On top of that they were the most active line in shot attempt differential (Corsi) averaging plus 8. It was mainly second finnish line (Kapanen, Savonen, Salin, Piha and Johansson) with troubles in clear path generation and suppression. Interesting take was a line matching in the game. First lines played against each other all game as well as second and third lines. Who were players with the most even strength shot attempts? And who were the most active passers for shot attempts? There is no wise evaluation of players after just one or two games. Nevertheless being able to measure quality of possessions for both teams and observing its dynamics during the game help us to better evaluate the game itself. And in this one, Finland needed more than push in just second period to be successful.